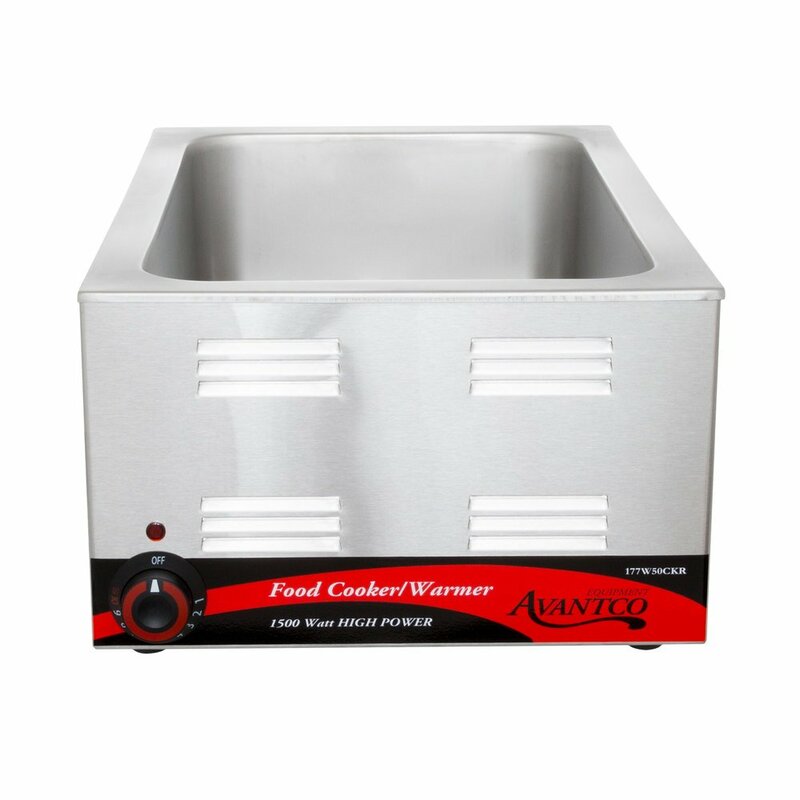 Serve up your signature vegetables, casseroles, fried foods, and virtually any other hot dish with this Avantco W50CKR electric countertop cooker / warmer! 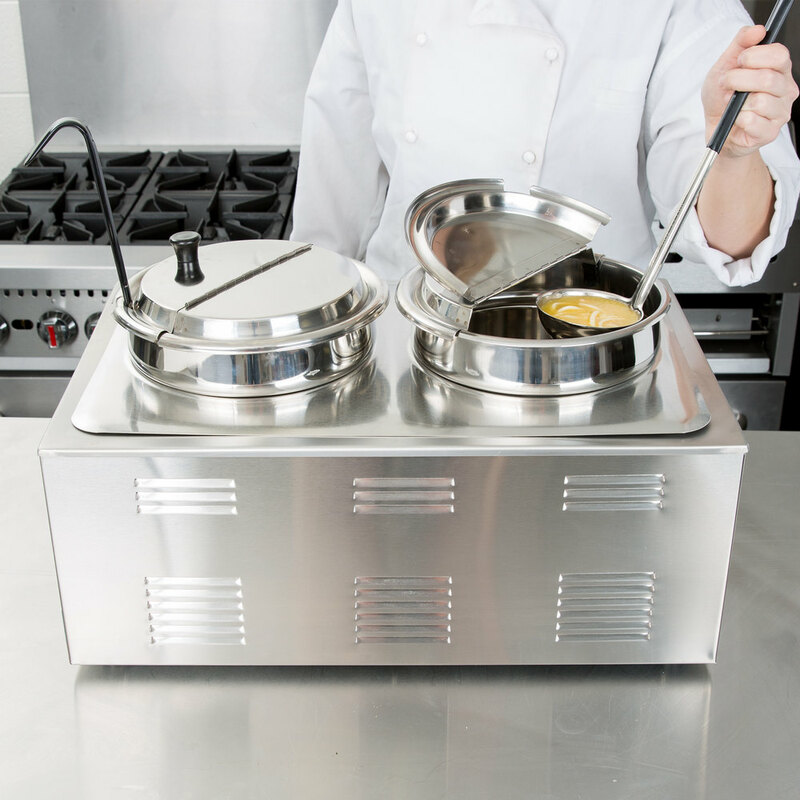 This unit can be used to rethermalize precooked food from a frozen or refrigerated state, or even to hold already-hot products at food safe temperatures! 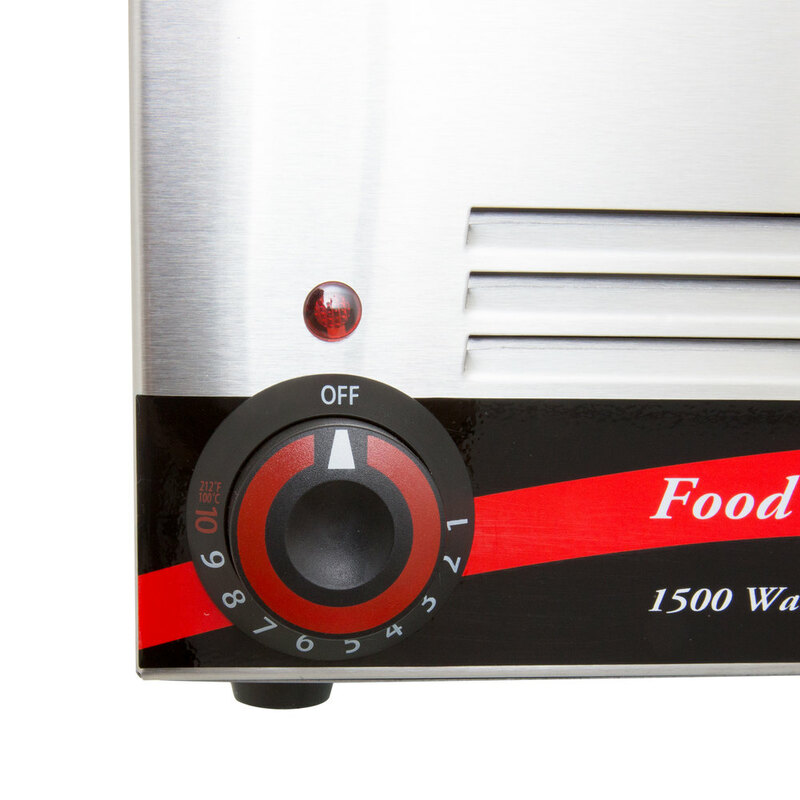 Whether you operate a buffet line, concession stand, or self-serve station, this 1500W cooker / warmer offers the functionality and versatility needed to always provide fresh-tasting products. 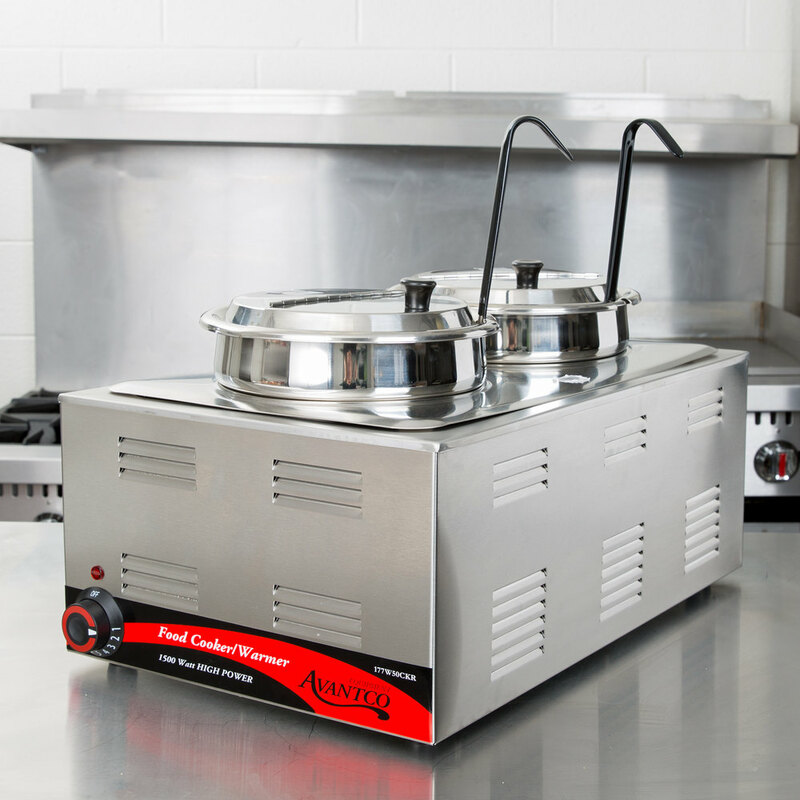 The temperature range is adjustable from 120-212 degrees Fahrenheit thanks to a simple control knob, and with less than a 30 minute warm up time needed, this unit offers a quick and effective way to cook up the products your guests love most! 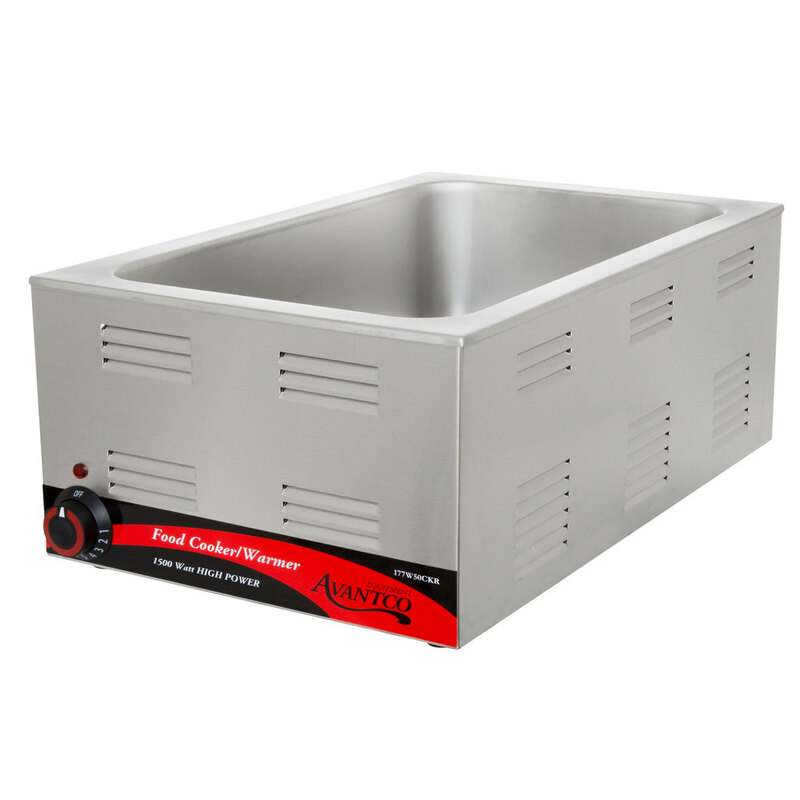 This 12" x 20" countertop food cooker / warmer is both lightweight and portable, making it an ideal solution for caterers or food trucks. It boasts a sturdy stainless steel water well that is sure to withstand the wear and tear of constant use, and the interior is lined with corrosion-resistant 20 gauge 18/8 stainless steel to make cleaning an effortless task. This unit requires a 120V electrical connection. Left to Right: 14 1/2"
Great product, heats up quickly and has a heat setting from 0 thru 10. Its light weight when its empty and fairly easy to clean. Robert S. from R&W Capital Inc. Does the job fine, warms everything appropriately However we do have issues with the elements burning out sometimes, where we have to restart them/replace them. Otherwise it preforms well. Great warmer from Avantco. Very easy to use and convenient. Keep our metleted chocolates in proper temperature all day long. Highly recommended. Will buy more. Mehmet C. from Leaff Inc.
We purchased this item, along with 3 inserts/containers. They kept our rice and grains warm throughout the day. Great quality and durable piece of equipment! I ordered this as a spare warmer, but it works so well I used it every day. This get HOT so watch the temp so you don't burn the soup. These are a good price compared to others I've seen in stores. They look very nice and have been keeping our food hot. The only downside is that when the heat setting is at zero, the light stays on. You have to unplug it in order to turn the thing completely off. One of our older steam tables broke and we were looking for a new and inexpensive one for our diner. This was the perfect find. It arrived quickly, was super easy to set up, and was in pristine condition. It heats up fast and works great! We use it every day! Product worked great - we used it for our daughter's graduation party. It kept the food warm and didn't dry anything out. It was also easy to clean up afterwards. Heats up food quickly to temperature from cold holding so it spends minimum temperature in the danger zone. On higher settings you can even cook some foods to a degree like a large crock pot would. We primarily got this to get chilled foods up to temperature quickly and then turn down to hold for events. This is our first countertop cooker. We are using it to hold our beans and rice. It is working very well. This is an excellent value compared to many others of the same size. We expect it will last. The first one we received was damaged and worked for only a day or so we called customer service ,they were great and sent the replacement within a day. It's been working fine for the last two months. Been using this regularly as both a warmer and cooker. Heats an entire pan of foil wrapped bean burritos to 140+ in about 20 minutes and keeps them very hot. High wattage however (1500w), so it sometimes trips the GFCI outlet or even the breaker if there is no GFCI. It also does not have a temperature dial, just goes from low to high so regulating temp is tricky. Ordered this product as our steamer and works great. Holds our meat at the state regulations and we are able to have more meat prepped and ready to serve. Warms fast under 30 min, keeps temp! It's a great warmer for any small business, size is compact and the price is the best I could find! Only thing that would be better is if it came with the top! Brett R. from my vegan soul l.l.c. this is a nifty machine and what makes it unique from others is it goes up to boiling temperature. I am able to make all kinds of things using it as a double boiler. it takes a bit of time to hear up though. just ordered this food warmer last week it got here in 4 days. really fast great shipping. the product is awesome i love the quality durability and the price of the product! thanks webstraunt! i use my warmer to keep hot dogs chili and cheese warm to ready to serve temp. Fantastic warmer heats up quickly and keeps a very consistent temp. We actually use this in another business we own that is a candle company to melt wax in bulk without spending much more on a wax melter. This is a great item to have in the kitchen. Now we can offer hot sandwiches which makes our customers very happy especally on those colder days. A totally awesome warmer. Of all of our equipment, we probably use this the most. Great for serving at events or for keeping pans of food hot at the shop until you need it on the line (we have a fast casual restaurant). The only problem we've encountered using these is that if you have two warmers and plug them into the same circuit, there is a possibility that circuit could blow and need to be reset. Other than that, no problems with this product! We use this warmer as the foundation to warm our soups. It fits perfectly on the counter and makes keeping multiple soups warm and ready to serve so easy! Works great. Easy to use. Does what it needs to do. Easy to clean. Keeps food nice and hot. ready to be served when I need it. Our warmer was not work properly. Needed a quick solution to fix the problem. This warmer was the solution. It fit in the space I had, heats up quickly, and keeps product at temp all day..
Great for keeping food warm for quick service. Easy to clean. Ours did burn out after six months,so we ended up switching to the 1200W. both are great. This full size electric counter-top food cooker/warmer arrived quickly and safely from Webstruantstore.com. The nice thing about this specific warmer is that it heats up very quickly! Great product at a great price. We've bought two and use them everyday for 8 hours straight, temperature is very consistent, we would definitely recommend them. This machine is great. It is priced very competitively. This unit can boil water, I love this feature. If you are just looking for a basic water table to hot hold soup, there is another model that is cheaper.